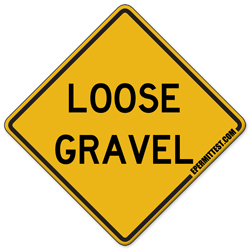 LOOSE GRAVEL. The surface of the road is covered with loose gravel. Go slow enough to keep complete control of your vehicle. Do not apply brakes suddenly or make sharp turns as this may cause a skid.